Nominated for 14 BAFTAs and the winner of 12 Academy Awards, this incredibly triumphing story of King George VI (Colin Firth) has earned every award it has been given hands down. The King’s Speech is the account of King George VI, who is forced to overcome his debilitating speech impediment to reach his full potential as a strong ruler which he becomes by default due to his Father’s death, King George V (Sir Michael John Gambon) and the resignation of his brother, King Edward VIII (Guy Pearce). Despite the premise of this film sounding as if it may become a repetitive and stationary story of pure frustration and despair, The King’s Speech was actually an incredible journey of expectation, victory and unity. After countless ‘royalty approved’ doctors, they were about to give up when Queen Elizabeth (Helena Bonham Carter) found Lionel Logue (Geoffrey Rush). This begins the strong friendship created between the King and his unlikely acquaintance as well as the trust that has to be built between patient and doctor. The humourous, innovative methods and remarkable outcomes of the pair are inspirational and uplifting. The cast for this movie was not short of perfect. 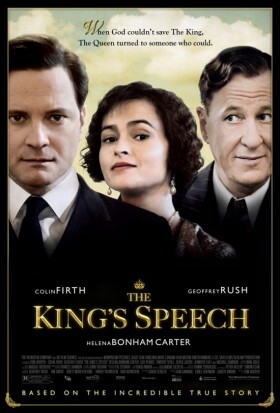 Colin Firth is the protagonist who became the stuttering King George VI convincingly. He shows that he is a versatile actor who is capable of mastering any genre – from Bridget Jones’ Diary to The King’s Speech. Queen Elizabeth is played by the eccentric and off-beat actress Helena Bonham-Carter who pulls off the composed and stately Queen (very unsurprisingly) faultlessly. The award-winning Timothy Spall portrays Winston Churchill exactly how I would expect him to play any of his characters; with skill and completely believably. The hero of the film is Lionel Logue, an “average Joe” in comparison to his patient of Royalty. Logue is played by Geoffrey Rush who surprises the King by his informal approach to speech exercises. Yet, after much deliberation from the King, he creates the casual and relaxed environment for the stuttering King to learn in without feeling superior. Tom Hooper shows himself to be quite a genius director. The composition of each shot supports the feelings of the King. With the claustrophobic feel of the environment when he is unable to communicate what he needs to say as well as the unsupportive feel of large and empty rooms. Warm and quality lighting creates the atmosphere of being in the presence of Royalty, contrasting the cold, dim, dark glow of the London streets. This is wonderfully layered film which allows viewers to look into it as deep as they like. Therefore, the second and third viewing is as enjoyable as the first. The King’s Speech is a fantastically made film with every shot perfectly composed and every scene well constructed – this really is a motion picture suitable for anybody old enough to appreciate it. There is no action or speed chases, but the inclination of tension and nerves kept me in the moment. This narrows the audience that this film may appeal to. However, I think that anybody who has the capability to appreciate triumph and success from shear hard work and determination will value this historical journey. I can guarantee that anyone who sees The King’s Speech will be able to take something away from it. Gallery | This entry was posted in All Film Reviews, drama, Editor's Pick and tagged awesome, bonham, colin firth, David Seidler, Derek Jacobi, film, film review, freak, Geoffrey Rush, Guy Pearce, helena bonham-carter, Jennifer Ehle, Michael Gambon, nz, review, the king's speech, timothy spall, Tom Hooper. Bookmark the permalink.